My friend Rajeev Ramanujan used to tell me that if one wanted to celebrate Holi and see its true colours, one had to be in the North and was he right about it. My cousin Latha with whom I was speaking on the 24'th of March asks me, "Do you know what is on the 27'th of this month?" and when I am blinking stars she yells, "Holi". From Delhi to Hansi, Haryana it is a 3 hour ride (4 max if the traffic is bad and it is) and we were surprised to find young kids throwing water-bags and packets at moving vehicles who had their windows down. These kids had already begun celebrating. And if you thought Holi was only celebrated outdoors you are dead wrong. Early morning on the 27'th I am doused in colour powders, red and pink inside the home. I repeat, "inside the home". For Mother, it was a rude shock, with marble floors covered in pink and red colours. Up North, this is considered absolutely normal. Then comes pouring of freezing cold water. I would have certainly enjoyed if the water was tepid but freezing cold water was literally sending shivers down the spine. To my surprise my brother-in-law was throwing color powder on my cousin in the Kitchen. I never expected that. We rush out and there is colour mayhem outside, with kids using buckets, water guns and pumps. I was warned not to take my camera and cellphone outside and particularly not to take any pics. I was also warned to stay away from colours (these are an oily type) that take much longer to wash away from one's skin. I still managed to snap some quick ones. Here they are. Ladies are spared but passers by, particularly guys on bikes aren't. Best part, you don't even need to know your victim to douse him in colours. 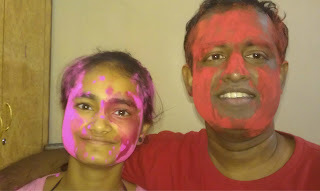 I was surprised when some teeny thing from next doors suddenly walked in and started applying color on my face greeting me with a "Happy Holi" and she was expecting me to do the same which I had to oblige. Such things are unheard of, down south. I was only wondering what a beautiful festival it was for kids considering the brotherhood, camaraderie and good will it promoted among them during their growing-up years. 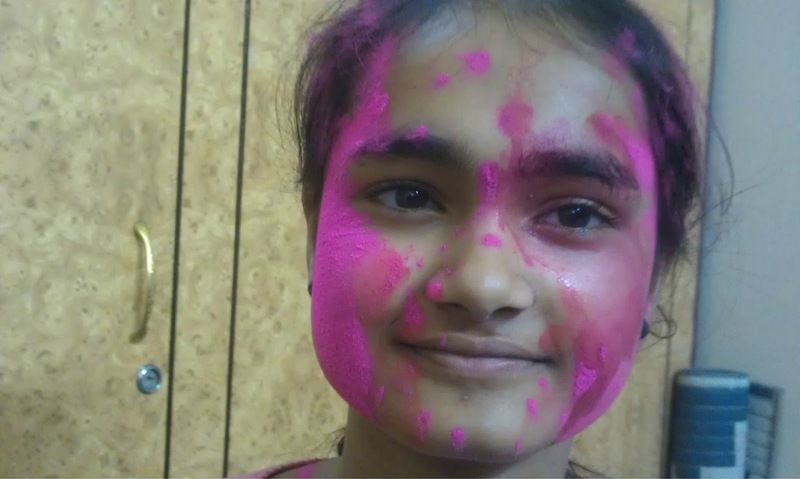 Foreigners who visit North India during the festival indulge and have a field day while in the South, there is hardly any real Holi and it remains confined to small groups. A few days after Holi, at Rajguru market in Hisar (yes these are the common names, Rajguru was one of the three to have been martyred along with Baghath Singh and Sukhdev) I could still see colours on people that hadn't washed away yet.